Microsoft has just announced the pricing scheme of the Xbox 360 Slim + Kinect bundle. It costs an appropriate-but-still-slightly-expensive $399 in the United States and £300 in the UK. Included in the package is an Xbox 360 Slim console with a 250GB hard drive, an Xbox 360 controller, the Kinect motion tracking system as well as Kinect Adventures. Jump in to motion-tracking glory on 4th November in America and 10th November in Europe for $399 and £300 respectively. 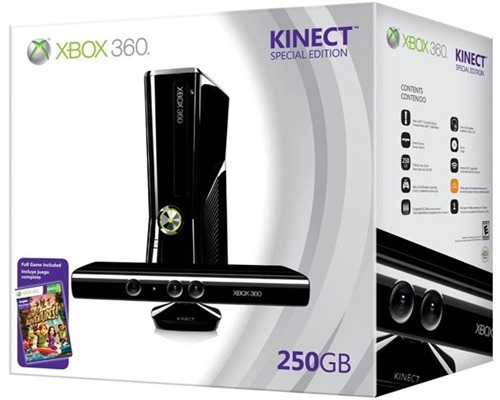 LONDON – 8 September 2010 – On 10 November 2010, be among the first to get Kinect for Xbox 360 with the Special Edition Xbox 360 250GB with Kinect, available for a limited period. This all-inclusive package includes the Xbox 360 250GB console, a Kinect sensor and "Kinect Adventures" for £299.99. Set up controller-free entertainment in your home with the glossy black 250GB console that boasts 802.11n built-in Wi-Fi, an internal removable 250GB hard drive and touch sensitive controls. Plug in the Kinect Sensor to the dedicated port on the console and load "Kinect Adventures" where you can float in outer space, experience the thrill of roaring rapids and tackle mountaintop obstacle courses. Enjoy controller-free fun with any of the more than 15 games launching with Kinect and experience new ways to enjoy your favourite entertainment. Xbox 360 paired with Kinect has something for everyone. Play an exciting game of football in "Kinect Sports," go for the ride of your lives with the massive jumps and full-body stunts in "Kinect Joy Ride," or adopt a pet tiger cub with "Kinectimals." Get the most out of your morning workout with "Your Shape: Fitness Evolved." Your virtual trainer will help you meet your specific fitness goals by providing feedback on your form in the comfort your own living room. Gather friends for a dance party, or work on your own moves one step at a time with "Dance Central" by MTV Games and Harmonix. Spend quality time with friends and family around the world through Video Kinect*. Watch your favourite movies, TV programmes and live sports from Sky on Xbox LIVE**, all with the wave of a hand. For more information on the Special Edition Xbox 360 250GB with Kinect, visit www.xbox.com. Please note that this is a special edition bundle, available while stocks last in the UK & Ireland.